Good question... A bridge was one of the things we hadn't considered, mainly because we had all likely assumed the distance between the two islands was too short to warrant the need for one. But as I looked back through the scope, there was what appeared to be two towers that spanned the width of a large bridge that stretch further West into the all encompassing fog, and out of sight. Somehow this was a lot harder to deal with than just stealing a boat and attempting to land on the actual island. "The thing is it looks like it's not even heading across to the island we need. Which means the only other direction it leads to is due West to the far side of this island, here." THEROS took out the map and pointed to the location of the Easterly side of the bridge, slowly drawing a line horizontally across with his finger to the West and stabbing at the Eastern side of the far island. I had never seen a bridge that curved in any particularly steep angle, so it was unlikely to veer off to the North and head directly to where the HQ was, so it only made matters a little harder when we had one additional obstacle to cross. A particularly big one at that. "I think first we need to get a little closer and see what we're up against. With the fog still pretty thick there's very little we can see, although that might prove to be quite useful..."
"Looks like we've got company. We'll definitely have to take those guys out before we move any closer. I think we're far enough away to remain hidden at the moment. Hopefully there's enough glare from those torches to hide us from their view." At this point I went ahead with explaining my plan, thinking that now would be a good a time as any to voice it. It was definitely a good one, and even if someone came up with a better idea, at least I could say I tried. COLUS however seemed to like the idea; he began nodding slowly as I went through the idea, before ending with a snap of his fingers as I concluded the plan. "Just what I was thinking. We'd need support from multiple angles to ensure we can get across this bridge safely. We don't know how many other guards are posted on the bridge, nor do we know what's on the other side or how long it is. I would like to tweak that idea though; instead of sending the entire group across, we send one of us. Two more in the towers, and the rest would be hiding back here. Once the forward scout could determine if it was safe, they signalled back to the other two, and we quickly advanced until the next stage." "The fog is going to make that difficult to an extent; you'd only be able to travel so far before we lost sight of the scout." "Well they would have to advance across and then come back and signal the others. For this idea I want Syeonyx and UOPETA in the towers. I will go ahead as the forward scout whilst the rest of you remain here. I head on until I can assure we're safe enough to proceed, before returning a short distance to signal you two. You then signal the others and we advance, with me meeting you all when you catch up to my point. If I see anyone coming along the bridge towards us, I can retreat and push us all back." "Sounds like a plan, but first we need to remove these two." "UOPETA. Syeonyx. Take aim, and when you're ready. 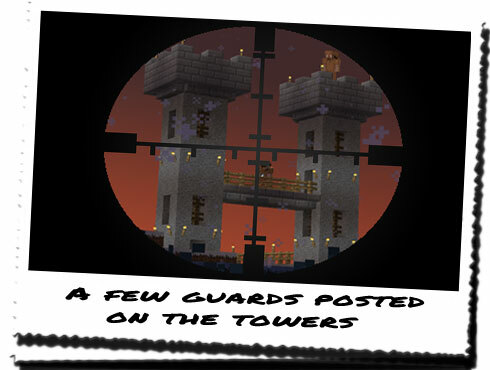 Try to take out the guard in the upper tower first so he doesn't see the other fall. Hopefully the railings will prevent them from falling to their deaths..."
Me and UOPETA moved forward slightly, crouching low to the ground, before taking aim. I let UOPETA have the first shot as he already had practise with the rifles. Once I could see the first guard was down, I took aim at the guard on the lower gangway. Holding my breath to steady my aim, I squeezed the trigger. Feeling a little kick from the spring, I centred the scope over the tower and watched as the guard slumped to his knees. "Two down. Everyone stay here, you two, follow me." 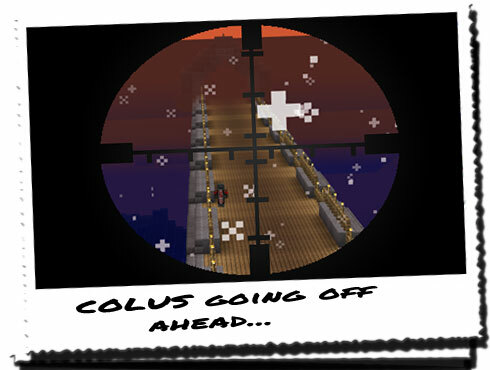 Myself and UOPETA followed COLUS in a low-down, quick run towards the towers. Looking all around, we made sure not to draw attention to ourselves from any possibly hidden guards. We reached the base of the left tower, when I remained, whilst UOPETA moved to the right one. We climbed the ladders, rifles slung over our shoulders, COLUS remaining beneath us until we were positioned. At the top, I sighted out over the bridge to see if there was any more opposition, but I couldn't see anything except a small structure on the far side. Maybe the bridge did bend off to the North...? I couldn't think of any other reason there would be a structure on the bridge, other than either a secondary set of lookout towers, or the other end... We motioned to COLUS that the coast was clear, and he began to make his way across. Peering through the scope, we followed him as he moved up, fading slightly as he edged deeper into the fog.